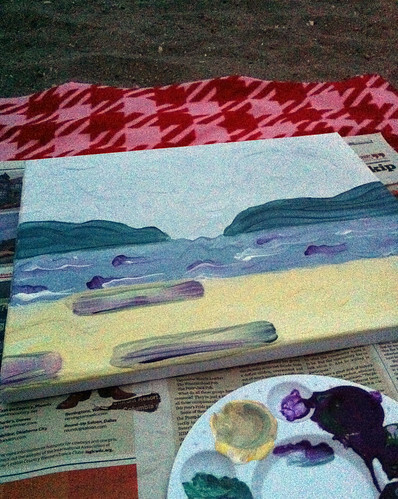 I arrived early for Painting On The Beach so I sat on a log to eat my pizza. I was immediately swarmed by a gang of loud and hungry seagulls, who expected me to share. I wrapped up one of the pieces and hid it in my bag. This lady sat there and did that for about 20 minutes. Then she started following around the above pictured seagull and biting at his beak, until eventually he threw up some food onto the ground for her to eat. I was amazed. He regurgitated a bit more, then decided it was too much and ate some of it back again. 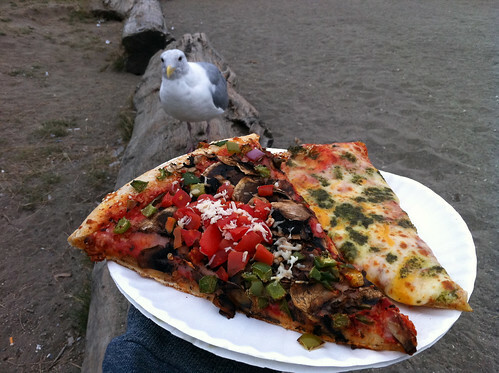 With my pizza hidden, the seagulls lost interest and left, and were soon replaced by my friends. 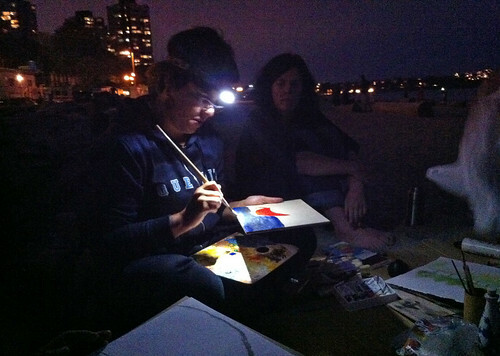 Here is a painting of what English Bay looked like, around that time. Soon I took my other slice of pizza from my bag and started eating it. 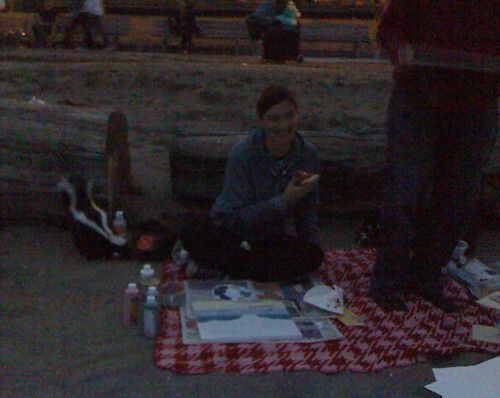 Just then a beach skunk came along and approached my pizza-scented bag. Everyone else ran away, but I just sat there, the closest I have ever been to a skunk. I really wanted to pet it, but I decided against it. 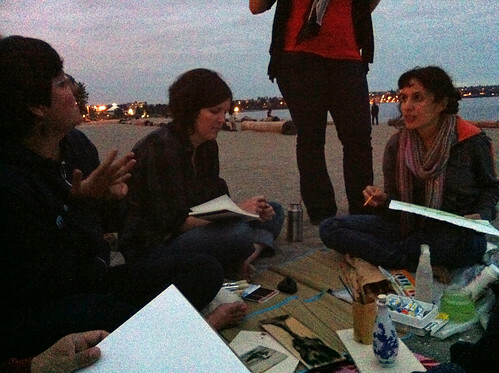 Eventually the skunk bid us farewell, and we painted into the night. 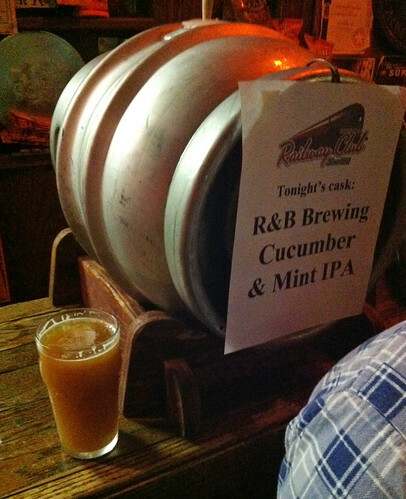 Later I headed to the Railway for the first night of CiTR's SHiNDiG, where I tried this week's cask ale, R&B's Cucumber & Mint IPA. 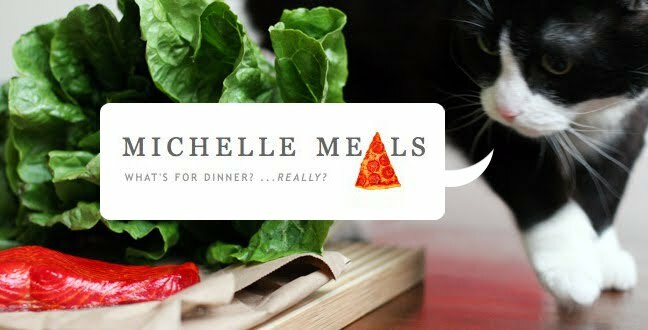 It was a nice try, but in the end it tasted just a little too much like salad. My goal this year is to make it out to every SHiNDiG, not just to see all the new bands, but also to try the cask ale that is featured every week.